Kiloview G1 4G Wifi Live Broadcast Video Encoder video from Changsha Kiloview Electronics Co.,Ltd. 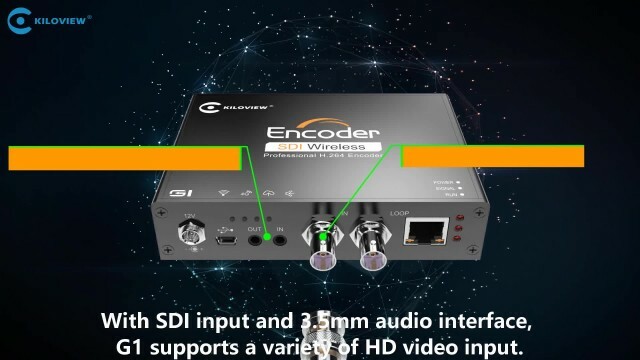 G1 wireless video encoder can encode the SDI video and push to internet broadcast platforms through Ethernet, built-in Wifi or 4g network to realize video transmission, which makes live broadcasting available at anytime and anywhere. 00:42 E2 H.264 SDI to IPTV Streaming Encoder Changsha Kiloview Electronics Co.,Ltd. 00:40 kiloview E1 h.264 sdi over ip encoder Changsha Kiloview Electronics Co.,Ltd.